Clarinetist on conducting is a result of a conducting clinic that Dr. Mallory Thompson presided over and I performed as a clarinetist. Many of these thoughts are timeless in regards to the conductor's role with the band/orchestra/choir. If you are a conductor, continue reading because I've seen it all (probably not all, but plenty). I'm amazed at how many of these thoughts are broken, ignored or WORSE. Also, during the time with Dr. Thompson, somewhere the conversations came up, "what do musicians want from a conductor?" 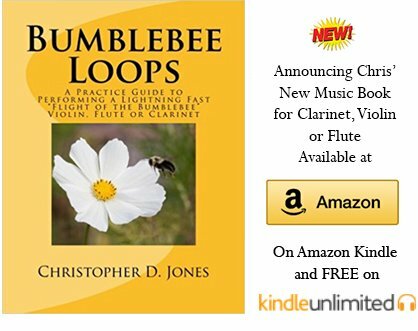 Following are thoughts from Chris of Clarinet-Now.com and inspired by conversations during the clinic. 3. Drag the music out of us. Pull our hearts out. If you are old enough to remember the second Indiana Jones movie, you will remember a scene where someone literally gets the heart pulled out of their chest. You see the arteries pulled as if strings. The heart is beating in the hand of the 'heart-grabber.' I've had a few conductors literally pull my emotions out by his/her musical interpretation, and I can imagine them holding my heart in their hands. This, my friends, is what I'm looking for, and it comes very rarely. So, Dr. Thompson does have this effect (plus more as I've only seen her over a three-day period), and if you have a chance to play in her band or study conducting from her, go for it. If you are a conducting colleague, study and learn from her. Hear this magnificently programmed and performed CD under conductor Dr. Mallory Thompson of the Richard Strauss Wiener Philharmoniker Fanfare, AV 109; Stravinsky’s Concerto for Piano and Winds; Michael Colgrass Winds of Nagual; Symphony No.1 “Jeremiah”: Profanation by Leonard Bernstein; and Bach’s Toccata and Fugue in D Minor, BWV 565. So, if you actually made it all the way to the bottom of this posting; congratulations, you have an interest in conducting or musical leadership. So, read more here on Clarinet Leadership or read some Clarinet Sectional Secrets tips here as well as adding your own secrets. What do you think about this Clarinetist on Conducting page? Let me know here. If you are a student, teacher or love hearing clarinet, how does Clarinet-Now.com help you?